At 59.4 metres, Vicky is the largest yacht to date from the venerable Italian yard Baglietto, but there is far more to her charm than sheer size. We break down four key reasons why she would be a smart investment. Built to Lloyd’s Registry standards and launched in 2009, Vicky has been kept in pristine condition ever since and is offered for sale by Ocean Independence as a turn-key proposition. 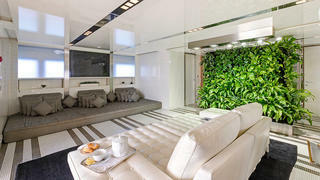 Her exquisite light wood interiors by Savaya & Moroni can accommodate up to ten guests in the utmost comfort, while space for 12 crewmembers means that every whim can be catered to. Her 10.7 metre beam allows for exceptional interior space and touches of oynx add further sophistication to this highly refined décor. At 59.4 metres, Vicky is the largest yacht to date from the venerable Italian yard Baglietto, but there is far more to her charm than sheer size. We break down four key reasons why she would be a smart investment. Built to Lloyd’s Registry standards and launched in 2009, Vicky has been kept in pristine condition ever since and is offered for sale by Ocean Independence as a turn-key proposition. 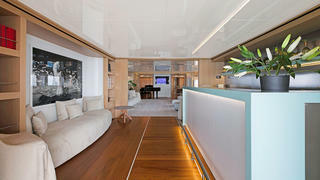 Her exquisite light wood interiors by Savaya & Moroni can accommodate up to ten guests in the utmost comfort, while space for 12 crewmembers means that every whim can be catered to. Her 10.7 metre beam allows for exceptional interior space and touches of oynx add further sophistication to this highly refined décor. Vicky is packed with premium features, making her a highly appealing charter proposition for an owner looking to offset the usual running costs. 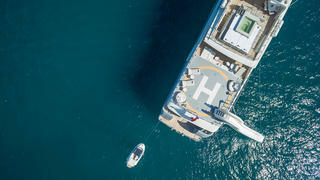 The spacious aft deck helipad is chief among these, offering ease of access for new guests as well as a flexible exterior relaxation space. Any buyer looking to charter out Vicky would have one guaranteed customer — the current owner is offering to charter her for two weeks per year in high season, at a rate of €500,000 per year for the next 5 years. Vicky is packed with premium features, making her a highly appealing charter proposition for an owner looking to offset the usual running costs. The spacious aft deck helipad is chief among these, offering ease of access for new guests as well as a flexible exterior relaxation space. Any buyer looking to charter out Vicky would have one guaranteed customer — the current owner is offering to charter her for two weeks per year in high season, at a rate of €500,000 per year for the next 5 years. Powered by twin 3,700hp MTU 16V4000 M90 diesel engines, Vicky exhibits the kind of sporty performance that Baglietto is well known for. Not only does she boast a maximum speed of 23 knots, but she can also cruise for up to 4,000 nautical miles at 13 knots thanks to her ample fuel capacity of 97,900 litres. With a sky lounge, Hammam and a stunning winter garden enclosed in glass, the bridge deck on Vicky sets her apart as a truly exceptional superyacht. Currently en-route to Monaco, Vicky is asking €31,500,000 and inspections are highly recommended. Interested? Contact Ocean Independence for more information. With a sky lounge, Hammam and a stunning winter garden enclosed in glass, the bridge deck on Vicky sets her apart as a truly exceptional superyacht. 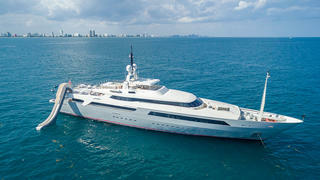 Currently en-route to Monaco, Vicky is asking €31,500,000 and inspections are highly recommended. Interested? Contact Ocean Independence for more information.